As global warming becomes a larger focus in the lives of people all over the world, many people are looking for ways that their purchases can lessen their impact on the earth. One way that people are lessening their carbon footprint on the world is by purchasing green items for their homes, including green countertops. There are many products that can be used to create a countertop that is considered green and the multitude of different materials, shapes, and designs available make finding a green countertop for your home even easier. 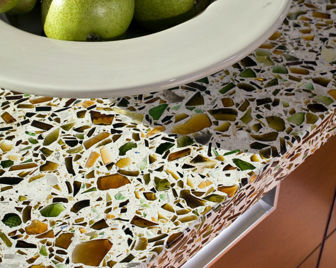 One of the most popular materials for a green countertop is recycled glass. Recycled glass countertops are created by fusing recycled glass shards with concrete for a countertop that is both beautiful and sturdy. A thick layer of sealant is applied over the entire countertop to protect the countertop from damage and to provide a smooth working surface for the kitchen area. Recycled glass can also be used to create glass tiles that can be placed on the top of a countertop form, creating a countertop that looks like it is made out of glass blocks. These countertops easily match any type of décor that is present in the kitchen and can be colored to enhance the look of the countertop. These glass tiles can be manufactured as large tiles or small tiles that can be arranged in a particular pattern to create a design. Another green countertop material is alkemi, a new material that has been created out of metal shavings embedded in a special resin. The resin used in these types of countertops can be dyed a variety of different colors, highlighting the metal shavings that are inside and allowing the homeowner to find an alkemi countertop that fits in with the décor of their home. The metal embedded in the countertop will catch and reflect the light present in the kitchen, giving the countertop a kind of space age glow when viewed. Recycled metal tiles are another green product that is great for creating a green countertop for the home. These tiles are generally made out of 100% recycled aluminum and the tiles can be attached to a green countertop foundation in any design that the homeowner chooses. If the homeowner desires, a design can be etched onto the surface of the tile to create a unique design for the countertop. There are many different materials that can be used to create a green countertop for the kitchen of the home. New designs and styles are being created every day as more and more people discover the benefits of going green with the products they purchase for their home. Going green does not mean you have to sacrifice style as many of these green countertop materials create a beautiful countertop for the home.